This entry was posted in Agriculture & forestry, Federal, Governance, Media, News and tagged Bob Goodlatte, Chesapeake Bay, EPA, TDML. Bookmark the permalink. The TMDLs – are openly hated by the AG community and loathed quietly by municipalities because of fears that it will affect growth – and make wastewater treatment more expensive. TMDL stands for Total Maximum Daily Limits and it basically puts a cap on cap on discharges because the Chesapeake Bay itself has a limit as to how much pollution it can except – without it being further harmed. So exact limits will be set for discharge plants and other places that show higher levels of nitrogen. These limits will directly impact these plants and farms. It’s the nitrogen, phosphorous and sediment runoff that damages the bays ecosystem and growing cities basically have more and more poop and urban storm water runoff and farms that grow large numbers of cattle and poultry are also affected. some have been willing to have it imposed on the Chesapeake Bay if not their own districts, but not Goodlatte whose district is the Shenandoah Valley -big AG including poultry. I’d not be surprised that whoever follows him and represents the 6th district are going to hear from the same folks who oppose TMDL. It’s a little hard to grasp because it’s not concrete. We do not know what target Va. committed to and what actions we would have to take and how we are doing, or if the targtes we were given are fair. Also seems unprecedented – what would be example of prior EPA executive action quite like it? I guess we have that Repub Comstock supports the EPA on this matter, which says something but could just say Dems have her feet to fire here in NOVA. Worse cases scenario EPA steps in and make us clean up Virginia. Oh the horror! The TDML Blueprint is a complicated process because the Chesapeake Bay is a complex and large ecosystem which has been harmed by multiple forms of pollution from multiple sources. Explaining it properly would take a multi-section article (like Reed’s efforts around Charlottesville). Boiling it down (a lot) … The EPA basically forced all but one of the states to meet the majority of the TDML goals. Pennsylvania has been the outlier. No state has met 100% of 100% of the goals but the agreement doesn’t call for that. The agreement essentially calls for meeting a majority of a majority of the goals. My frustration is that lame duck Goodlatte has launched another blitzkrieg attack on the EPA’s enforcement capability that is opposed by a majority of Virginia House represents, both Virginia US Senators and, from all media accounts, most Virginians. He has launched his attack with no specific commentary about why this latest (2018) effort makes sense. I’m a supporter of TMDLs… it’s nasty medicine for a sick bay… there are no easy answers… too much human and animal (cattle/poultry) poop leads to higher and higher nitrogen and phosphorous in a limited ecosystem with a fixed limit as to what it can assimilate before it’s damaged. Cattle and poultry operations will also be affected. But if we want a healthy Bay – this is what you have to do…and not everyone is on board… it’s a classic tragedy of the commons… Each activity in and of itself is not killing the bay -but add them all up and then have more growth of people and animals to feed people – and we will inflict more and more damage the Bay. Some folks may not remember.. the Potomac used to be something akin to an open sewer… and it took decades for that and other pollution to ultimately damage the bay – and it’s taken decades to bring it back and now we’re at a crossroads…. do we lose what we gained and go back to a seriously damaged bay or do we bit the bullet and sustain our progress? Just generically, I would say some EPA plans like the Clean Power Plan and the 54 CAFE MPG Auto by 2025 targets were extremely strict targets invented by the Dems. So as much as I like a clean Bay I need to somehow get calibrated on how stringent the targets are: reasonable or impossible but insisted upon anyways. An impossible example was the renewable fuels standard which mandated more than 10% ethanol in gaso which exceeds the blend wall allowable by Auto manufacturers. Remember that the Bay states (including Republican dominated Virginia) agreed to the TDML blueprint. Also remember that (other than Pennsylvania) the Bay states were meeting the agreed-to targets. If left to the states themselves, Virginia will suffer from Pennsylvania’s intransigence. I don’t equate the EPA to “dems”. It was started under Nixon and it has for all that time been under attack by the GOP/Partisans and business interests who have tried over the years to essentially gut it. Every single rule the EPA does goes through an extensive public comment period and their science behind the rule is usually rock solid. Below are the list of laws and regs that have been created over it’s existence that many folks don’t know at all or take for granted. Every one of these went through a cost-benefit analysis… legal challenges and political challenges – and they remain in place and supported by the vast majority of people – and their elected – with the exception of some folks on the right who would get rid of the EPA altogether – and that number has grown -no question but they still constitute a small minority of people. 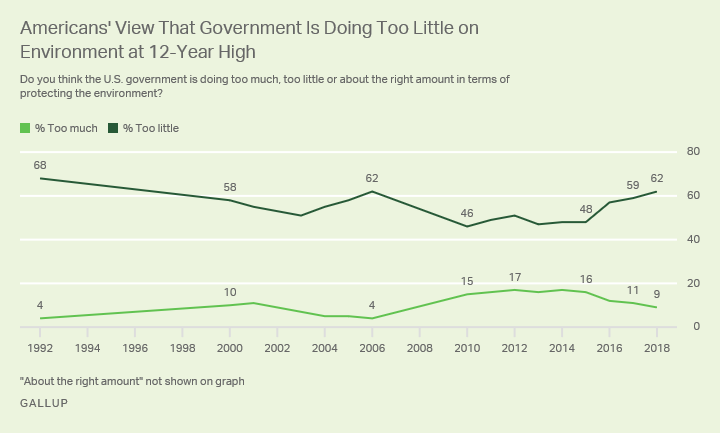 Support for the EPA has stayed high from the time it was created. Larry it is not always EPA. Sometimes the Congress or Pres. sets the impossible targets. But it is usually Dems who feel there is no excuse to not meet impossible targets, and refuse to budge. Eg; 54 Cafe MPG. I am no expert, but for years I have heard farm representatives complain that the burden of compliance with TMDL’s has fallen most heavily on them, when the nutrients that end up in rivers can include other sources – including our own front yards fouled by the neighborhood dogs or kept green by too much fertilizer. In his initial post DJ taunted Rep. Brat with evidence of pollution in the James which looked very un-agricultural to me (unless there is a farm use for condoms.) Most of the upgrades to sewage treatment plants have been accomplished at this point, I think, so EPA is having to look elsewhere when it wants to further reduce the targets. I know a bit more about the ozone situation, and in that case I do think EPA overreached, having achieved significant improvement and following up with proposed new targets where the cost-benefit result was less reasonable. I think those proposals went away. The TMDL for the bay may not be parallel. It seems Goodlatte’s amendment has continuously failed, and so far the 2018 version is not yet law, but if it fails because the EPA comes to the Hill to listen to the concerns and promises to be reasonable, then it might be doing some good. Every recent scientific survey I have read puts agricultural runoff as the Chesapeake Bay’s #1 pollution. However, urban and suburban pollution is a close second. Agricultural interests who believe they are bearing a large part of the burden are right. They are a large part of the problem. States and the federal government have set aside funds to help farmers pay for the necessary measures required to come into compliance. The vast giveaway to BigAg known as the Farm Bill last had allocated $100m for this. The new version (being debated now) allocated $300m. In fairness to the BigAg lobbyists, a number of non-ag polluters are also failing to meet the goals – the Port of Baltimore and the City of Alexandria among them. My frustration with so-called conservatives is that they want to protect property rights only when threatened by the government. They are front and center to pass legislation stopping Loudoun County from impinging on Martha Boneta’s presumed right to run a farm store but oppose legislation that prevents BigAg from polluting other people’s property.